Bike the Creek Bicycle Friendly Connections & Aboriginal Day were our 2018 themes. We were blessed with liquid sunshine amidst brief almost dry spells. Faces shone on happy riders who came out to experience new trail connections and the three official ceremonies for 2018. Bike the Creek Partners City of Brampton, Town of Caledon, Toronto and Region Conservation, and BikeBrampton were pleased to welcome dignitary riders: Share the Road Executive Director Jamie Stuckless and Peel Medical Officer of Health Dr. Jessica Hopkins. Brampton Councillors Doug Whillans and Jeff Bowman stopped by to wish the riders well before the start. David Laing and Region of Peel MOH Dr. Jessica Hopkins, almost ready to start their rides! Caledon Mayor Allan Thompson, Caledon Regional Councillor Johanna Downey, Dr. Jessica Hopkins and her partner all cycled to the first stop in Heart Lake Conservation Area. Also cycling was TRCA Director Chandra Sharma (not shown here). Three of the rides used the newly constructed northern trail into the park. Lorie and her corporate team of riders from Greenfield Global took the Nature Ride into Heart Lake Conservation Area. Director Chandra Sharma brought TRCA greetings to the Indigenous Elder’s Official Ceremony at the Medicine Wheel Garden in Heart Lake Conservation Area. Councillor Johanna Downey and other cycling dignitaries looked on. Bike the Creek riders present were honoured to witness the Official Ceremony and Drum Circle. The Canoe Garden and Medicine Wheel Garden are beyond the TRCA tent. At this point, volunteers Wayne Noble and David Laing led some dignitaries headed north into Caledon. Volunteer Dayle Laing led other dignitaries south in Brampton. Volunteer Polly Thornham led dignitary Peel Associate Director of Health Dr. Lawrence Loh south as he jogged pushing his children in a carriage. TRCA Director Chandra Sharma speaking at Official Opening Ceremony of Caledon bridge, connecting Southfields and Valleywood communities. To Chandra’s left are Councillor Barb Shaughnessey, Sylvia Jones MPP Dufferin-Caledon and Mayor Allan Thompson. Badlands Pavilion, located at Spirit Tree Estate Cidery. Susan from Caledon Tourism displays Caledon Cycling maps. Pumpkin doughnuts were provided FREE for riders from our sponsor Downey’s Farm. Sponsor Spirit Tree Estate Cidery provided non-alcoholic cider and bars. Badlands Pavilion, Serguei staffed Region of Peel’s booth showing new cycling infrastructure on Olde Baseline Road and the work done on the Badlands Parking lot. Caledon Pavilion, located near John Clarkson Park. Nicole from Parks & Recreation provided riders with homemade cookies complements of our sponsor Butter & Cup, and pumpkin doughnuts, complements of our sponsor Downey’s Farm. Dignitaries include Caledon OPP, David Laing, TRCA Director Chandra Sharma, Councillor Johanna Downey, volunteer Wayne Noble, Councillor Nick de Boer, Mayor Allan Thompson, MPP Sylvia Jones. South on Heart Lake Road temporary bike lane. A road permit closed the southbound lane to accommodate riders travelling north on the City Loop Ride and south on the Nature Ride. MOH Dr. Jessica Hopkins discussing Franceschini bridge with Brampton Landscape Architect Jake Mete (slightly behind), and Brampton Senior Manager Transportation Planning Henrik Zbogar, and Dr. Hopkin’s partner. Brampton Parks Franceschini bridge Pavilion – Jessica, volunteer and the Artist of the gorgeous bridge deck design! Brampton Active Transportation booth, Franceschini bridge – Tamara featured the new Brampton Cycling Guide maps! Franceschini bridge – City Loop riders travelling west, Nature Riders travelling east. Bridge provides link between east and west sides of Esker Lake Trail. The LED lighting system along the top railing, turns different colours at night. There is an Eco-Counter that logs pedestrian and cycling traffic! Official Opening of Franceschini Bridge over Hwy#410, copyright photo courtesy of Herman Custodio Creative Photography (Facebook page). Thanks Herman, you make everyone look good! The dignitary south group stopped at Historic Bovaird House, where Chairman Michael Avis and his team explained the history behind Pendergast Log House, slated for official opening on July 1st. Region of Peel’s Walk+Roll Peel was the Title Sponsor, providing lunch funding. Hungry returning cyclists and volunteers enjoyed BBQ Gourmet catering back at Jim Archdekin. Sonia Sidhu MP Brampton-South, welcomes returning riders TRCA Director Chandra Sharma and David Laing – photo courtesy Sonia’s Twitter feed. Volunteer Wayne Noble, David Gilies, Sylvia Jones MPP Dufferin-Caledon, Mayor Allan Thompson. Jamie Stuckless brought greetings from Share the Road Cycling Coalition, on the value of our Bicycle Friendly Connections theme, celebrating our new cycling infrastructure and that both Brampton and Caledon have their Bronze Bicycle Friendly Community status. Dr. Jessica Hopkins, Region of Peel’s Chief Medical Officer of Health spoke about the value of activity for our physical and mental health, and the value of our having a built environment that encourages this activity. Ruby Sahota MP Brampton North brought greetings and a plaque on behalf of the Federal Parliament, that recognizes the benefit of the “new cycling infrastructure that gives people greater ability to reduce their carbon footprint while also being physically active”. Sara Singh MPP Brampton Centre brought greetings on behalf of the Province of Ontario. Master of Ceremonies, TRCA Project Manager Elizabeth Oakley. Mayor Allan Thompson brought greetings from partner Town of Caledon, continuing the friendly rivalry between the two communities. Regional Councillor Michael Palleschi brought greetings from partner City of Brampton and returned the friendly challenge of Caledon. Jaime Stuckless, Kevin Montgomery, Chandra Sharma, Ruby Sahota sharing Bike the Creek fun! Peel Regional Police Constable, Share the Road Executive Director Jamie Stuckless, Brampton Regional Councillor Michael Palleschi, TRCA Director Chandra Sharma, Ruby Sahota MP Brampton-North, MOH Dr. Jessica Hopkins, Sara Singh MPP Brampton-Centre, David Laing, Dayle Laing. 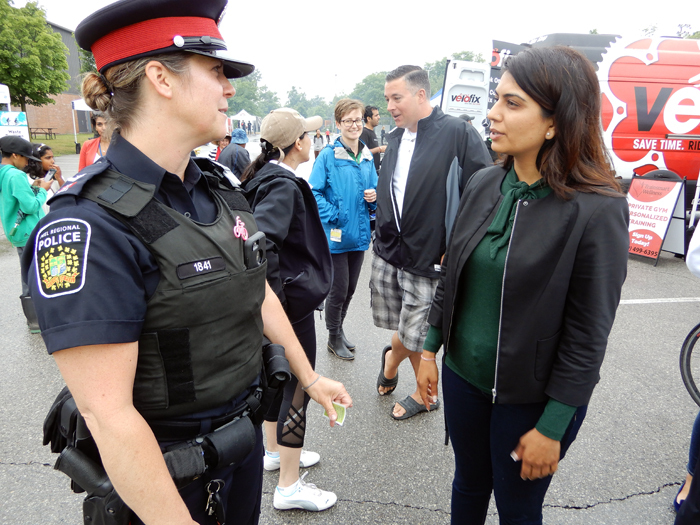 Peel Regional Police Constable discusses Crime Prevention with MPP Sara Singh. Sponsor Peel Regional Police Crime Prevention booth registered bicycle serial numbers for their anti-theft program. Sponsor Velofix Caledon worked non-stop on repairs from their truck (booth). They were called out on 2 occasions to assist riders on the routes. Sponsor Trainsmart Wellness booth provided mini-massages and contributed to our prize draw. Sponsor PAMA (Peel Art Gallery Museum + Archives) booth hosted craft activities for children (and those young at heart). Our BCAC Bike Rodeo was cancelled due to wet pavement, as per safety protocol. Title Sponsor Walk+Roll Peel booth was well staffed, featuring Bike Month Brampton and Caledon free t-shirts and cycling prizes for riders answering safety skills-testing questions! Sponsor Orange Theory Fitness booth provided passes for their location. Their bright orange booth brightened our day! City of Brampton engaged Wayne Henry to perform bike tuning / basic repairs. Bike the Creek planning committee appreciates generous sponsorship from WIKE, the Walk & Bike Company, Caledon Hills Cycling and The Cyclepath Brampton. Bike the Creek was pleased to include Peel Memorial Wellness Centre Pavillion and Historic Bovaird House Pavilion. Rain did not stop the keen cyclists of Bike the Creek! Brampton Grow Green BEAC booth volunteer Trevor set to depart with his trusty companion at end of event. Bike the Creek Planning Committee members Emma and Nelson – wow, we did it!